The Canning Doctor: The Farm is Back! Gotta love spring! Last week the farm opened and Steph got the first share. 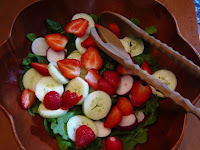 This week was my turn, and I picked up: 1 large bok choi, 1 bowl of arugula, 6 Hakurei turnips, 4 radishes, 6 garlic scapes, 1 and a half pounds of spinach, 1 quart of strawberries, 1 pint of snow peas, and a bunch of cilantro. One and a half pounds of spinach is a LOT of spinach. Tonight we're having a spinach-arugula-strawberry salad, lobster, corn on the cob, and the rest of the strawberry-rhubarb pie. Love, love, LOVE the farm!